For the former Obihiro Airport, see Tokachi Airfield. 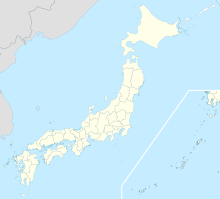 Tokachi–Obihiro Airport (とかち帯広空港, Tokachi-Obihiro Kūkō, or sometimes simply Obihiro Airport) (IATA: OBO, ICAO: RJCB) is an airport located 13.5 NM (25.0 km; 15.5 mi) south of Obihiro Station in Obihiro, Hokkaidō, Japan. The airport opened in March 1981, initially with a 2,000 m (6,562 ft) runway, taking over the role of the former Obihiro Airport, now Tokachi Airfield. The runway was extended to 2,500 m in November 1985. ^ "Obihiro Airport" (PDF). Japanese Ministry of Land, Infrastructure, Transport and Tourism. Archived from the original (PDF) on 21 October 2016. Retrieved 7 January 2017. Wikimedia Commons has media related to Obihiro Airport. This page was last edited on 3 July 2018, at 16:30 (UTC).